Pilgrimage in Cracow region, Your group tours to Poland - discover exciting Poland with us! Your group arrival to Krakow airport, where you are welcomed by our guide. 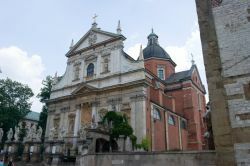 Your lunch and next, visit the sanctuary in Cracow – Łagiewniki, famous with sister Faustina and her grave. Visit the Shrine of Jesus and Mass at 17:00. Dinner and overnight stay in hotel. Breakfast, Mass and guided tour of Cracow: the Main Market, St. Mary’s Basilica and historical trade pavilions of the Cloth Hall, the Royal Route, Collegium Maius, Wawel Hill with its renaissance Royal Castle and Cathedral (the seat of Cardinal Karol Wojtyla before he became Pope Jahn Paul II). Dinner in the restaurant on Old City, overnight. Breakfast. Departure to Ludzmierz. Visit the oldest Parish and church (founded in 13th century) in Podhale region. Sanctuary visited by John Paul II in 1979 during his first visit in Poland as a Pope, Mass. Departure to Zakopane. City tour 14:00 with visiting sanctuary of The God's Mather of Fatima and wooden Jaszczurówka Chapel. Dinner and overnight. Breakfast. Departure to Kalwaria Zebrzydowska, the most important pilgrimage centre in Małopolska Region. Walk along the Via Dolorosa, built in 17th century by Zebrzydowska Family and visit Bernardine Church. Departure to Wadowice, birthplace of John Paul II. Visit his former home and parish church. Transfer to Oświęcim. Visit the former Nazi concentration camp Auchwitz-Birkenau, where St Maximilian Kolbe and St Edith died. Dinner, Mass at your hotel and overnight. Breakfast. Departure to Częstochowa. Visit to Jasna Góra - Czestochowa monastery the most important place for Polish Catholicism. The tour includes the Paulinian’s Hill, the Treasury and the Chapel with the famous icon of the Blessed Virgin Mary, Mass. Dinner in Czestochowa, transfer to Cracow for an overnight. Breakfast, transfer to the Cracow airport. Return flight. Price includes: transfer by a luxury coach, accommodation in 3* standard hotels and guest house in double or twin bed rooms with private facilities, 5 breakfasts and 5 dinners, service of our tour leader, local guide services in Cracow, Zakopane, Auschwitz and Częstochowa. Additional info: entrance tickets not included in the price – approx 15 Euro / person.